PHOTO TUTORIAL | PRINTABLE RECIPE | HUNGRY FOR TIPS? "Um…" Boyfriend Javelin is standing in front of the open refrigerator, staring intently at something inside. And I brace myself. "Are you planning to use these strawberries…soon?" he asks, his voice bending up at the end. Trying not to sound irritated. "Yes," I say, with all the gritty determination I can muster. "Hopefully tomorrow." And I try to remember why I bought those darn berries to begin with. A pie, maybe. Which might explain that past-date tub of mascarpone cheese blissfully bloating at the back of the fridge. "Are they looking bad?" I ask. He clears his throat and reaches into the fridge to pull out the plastic carton. What was once a full container of fresh, bright red berries, has now collapsed down to about two-thirds the volume. And filled with dull, brownish red berries. With hazy splotches of white fuzz. "Well," Boyfriend Javelin says slowly. "You might be able to still use…some of these?" "Maybe…" I say doubtfully, keeping a safe distance from the container. And shivering a little at the thought of digging through that cold, white fuzziness with a bare finger. Without moving, I stretch my neck to peer a tad closer. "Are there ANY without mold?" He pops open the lid and lets out a sigh. "Well…I don't know," he says, giving the carton a brisk shake. And letting out a hiss as droplets of juice strike his bare toes. "There might be one or two. Maybe?" He extends the carton towards me and I peer in, but I don't take it. White fuzz. Everywhere. Don't fret. I didn't make this sauce using moldy strawberries. In fact, those particular berries met a covert death at the machinations of the kitchen sink disposal - if there can be anything covert about a noisy, clattering disposal not so subtlety masked by boisterous, off-key singing! Boyfriend Javelin has been known to rescue fuzzy berries on occasion and I always feel a bit guilty at my lack of mercy. While I wouldn't attempt to use fuzzy berries, this sauce is certainly the perfect way to use up those somewhat over-ripe, not-quite-presentable berries. A little bit squishy? No problem. Oozing juice? Perfect. Just chuck them into a saucepan, add a bit of sugar, a squeeze of lemon - and you've finished the hard part. 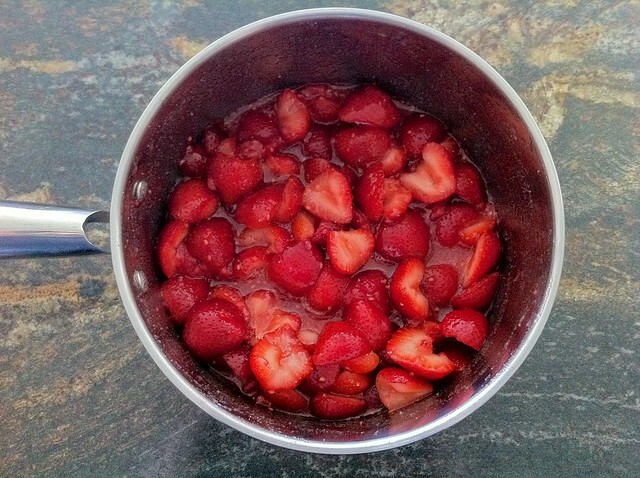 A little simmering, a quick puree - and you've transformed sadness into homemade strawberry sauce. The possibilities for a homemade sauce are both obvious and subtle. 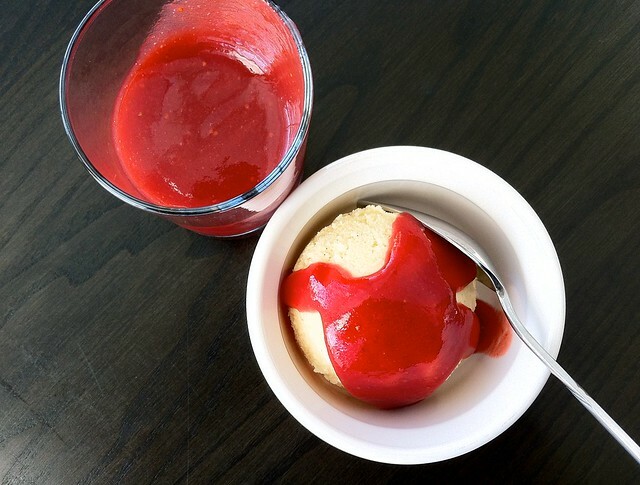 I love this sauce over ice cream, cheesecake and strawberry shortcakes, but it's equally impressive as base for strawberry ice cream, strawberry pie, strawberry milk and more. And the flavor is so much brighter and more authentic than that artificial medicine stuff bottled and sold everywhere as "strawberry syrup". I don't know what that stuff is, but it has nothing in common with real strawberries. Even the coloring is wrong - some kind of other-worldly mutant neon magenta. 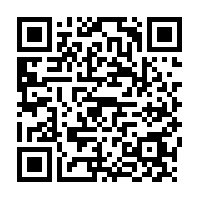 STORY | PRINTABLE RECIPE | HUNGRY FOR TIPS? 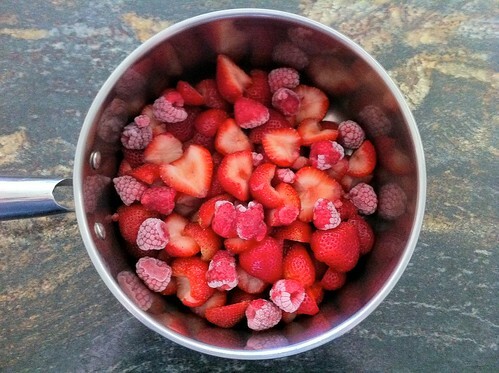 You will need 1 pound of fresh or frozen strawberries. 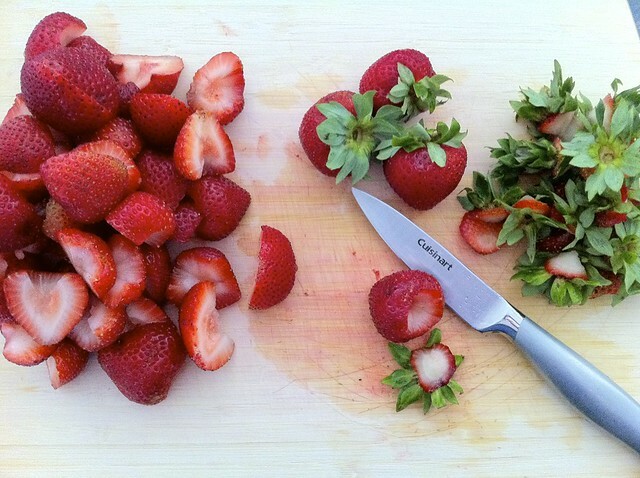 If using fresh berries, hull and halve the berries. Add the halved berries and 1/2 cup of fresh or frozen raspberries to a medium saucepan. 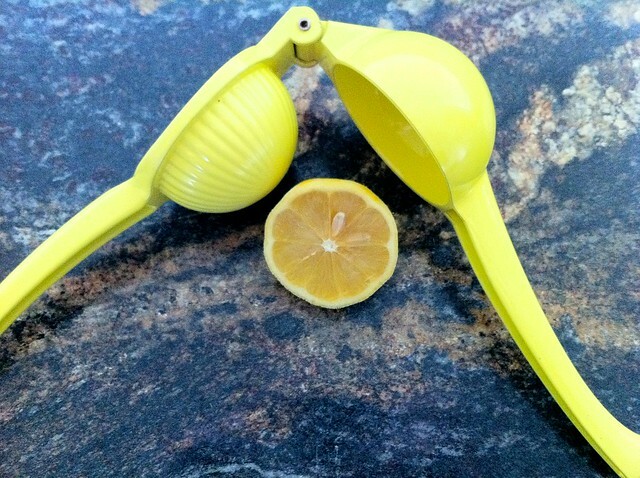 Squeeze the juice of 1/2 a lemon over the berries. 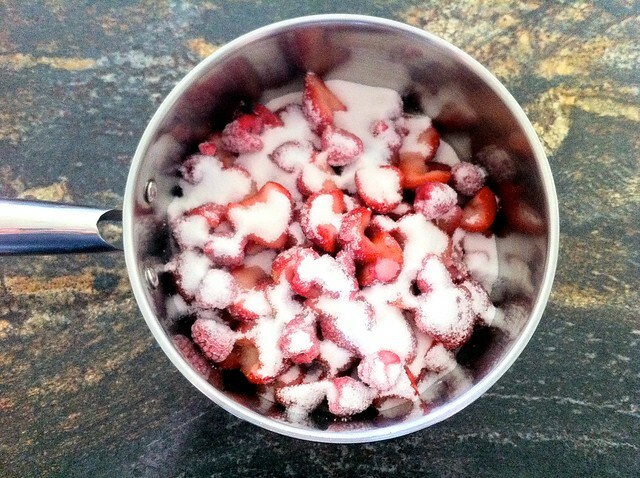 Sprinkle 3/4 cup of granulated sugar over the berries. 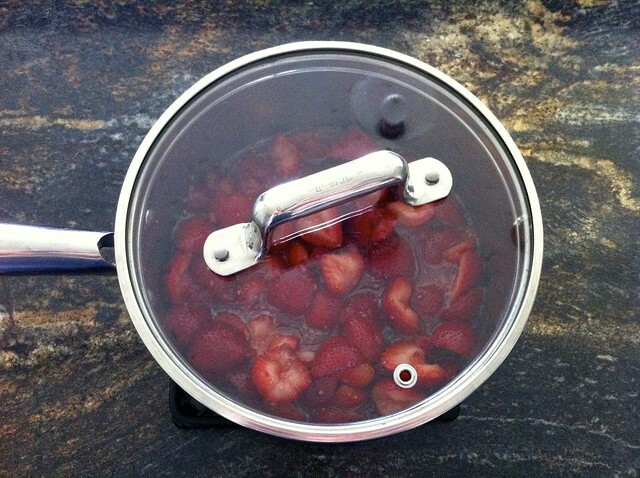 Let the berries macerate for 15 minutes. Cover the saucepan and bring to the boil. Simmer over low heat for 20 minutes, stirring occasionally. Cook the berries until mostly broken down. Puree the berries until smooth. Optionally strain to remove the seeds. Cook the sauce over medium heat for 15 minutes until thickened. 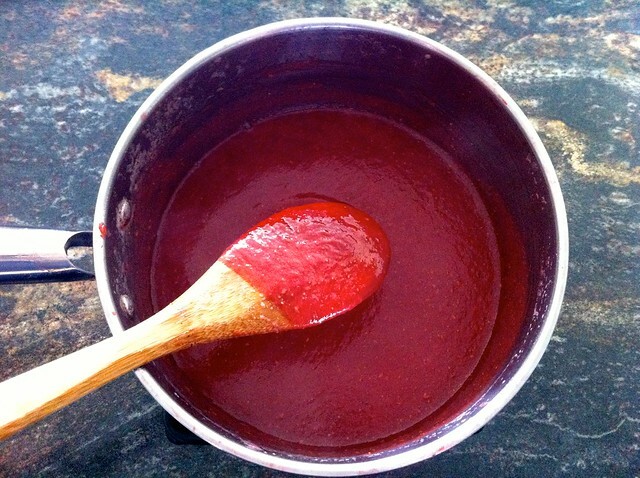 Remove from heat and allow the sauce to cool to room temperature. Chill the sauce. 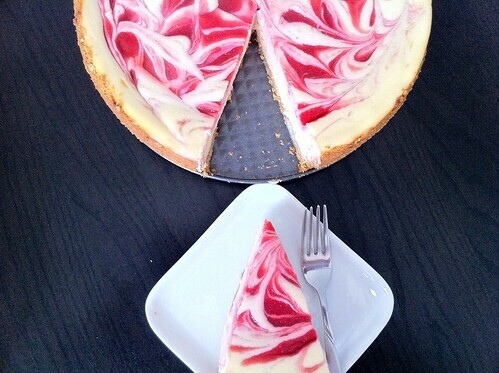 Serve the sauce chilled as a topping for ice cream, cheesecake or other desserts. STORY | PHOTO TUTORIAL | HUNGRY FOR TIPS? Let the sauce cool to room temperature before transferring to an airtight container; serve chilled as a topping for ice cream, cake, cheesecake, etc. 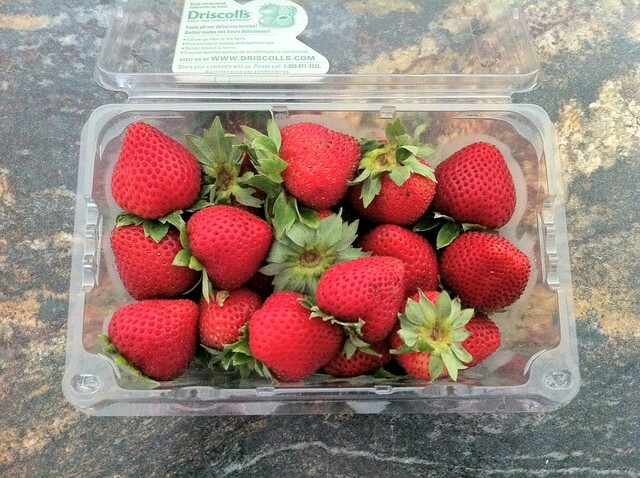 Strain: I prefer my strawberry sauce as smooth as possible without hundreds of tiny seeds to crunch on. If you don't mind seeds, don't bother straining. However, if you do strain, don't wait until the very end (after the sauce has thickened) or you'll have a hard time passing it through the mesh. 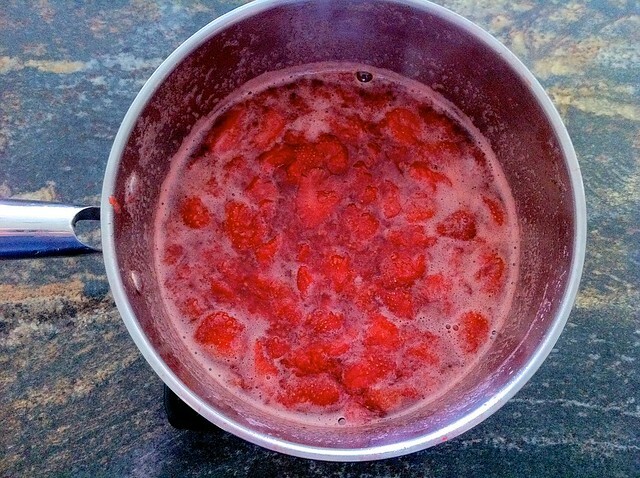 Lemon and Raspberries: Why add lemon or raspberries to a strawberry sauce? Because a handful of raspberries and a squeeze of lemon brings out the strawberry flavor. Trust me - you won't tasty raspberry or lemon, but both make the strawberries taste brighter and sharper. Fresh or Frozen: You can make this sauce with either fresh or frozen berries. I like to stock up and freeze off bags of berries when they're in season and the good news is, regardless of fresh or frozen, the final sauce turns out the same. Which means you can make this sauce year-round. Multipurpose: This sauce is certainly delicious as a topping for breakfast or dessert: ice cream waffles, pancakes, cheesecake, shortcakes, crepes, etc. 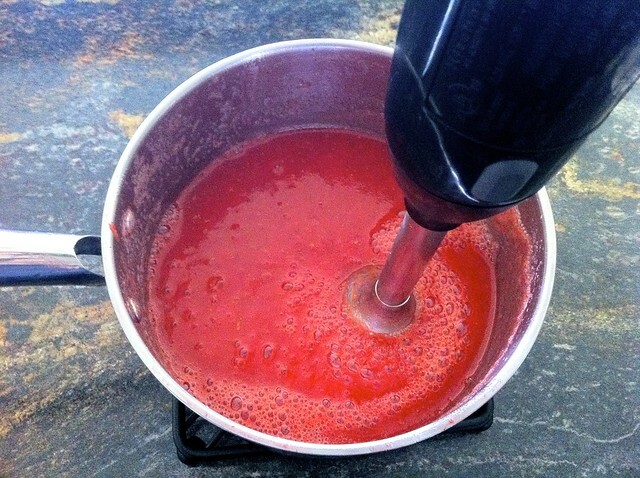 But I also use this same sauce as a base for a variety of sweet treats including strawberry ice cream, strawberry pie, strawberry-swirl cheesecake - and more recently, strawberry tiramisu and strawberry sweet rolls. Simple sauce, so many options. My friends Anneli (from Delicieux) and Louisa (from Eat Your Veg) host a wonderful monthly challenge called Four Seasons Food (SFS) - check it out and enjoy this month's delicious theme of Sliding in to Autumn! Thanks for the kind words, Anneli - the sauce will keep for at least a couple weeks in the fridge and I would also imagine it could be frozen without a problem. But I haven't tried that yet. I'm so glad you enjoyed and happy to share with FSF! Per chance did you in fact melt rubies instead of strawberries? The colour is so jewel-like and rich. Beautiful! Ooooh that just looks so sweet, nice and moreish. I would love some with greek yoghurt and almonds. Sharing this. Could definitely pour some of this over ice cream! I'm really dreading seeing berry season disappear on us. It's getting close, but you are doing a great job keeping it alive! 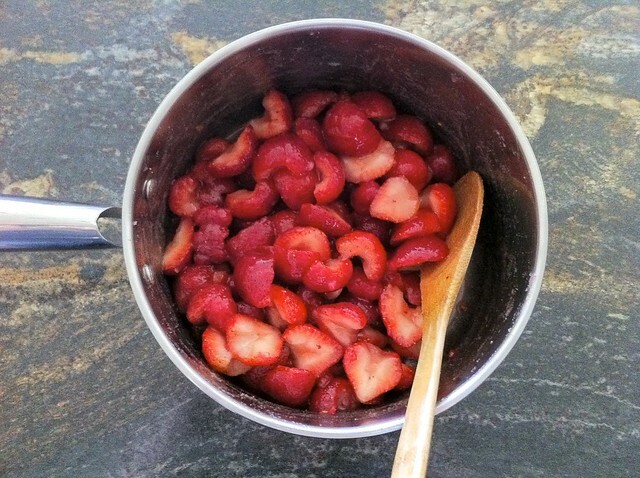 I often throw together frozen berries to make a quick sauce when I need to last-minute spruce up a dessert.